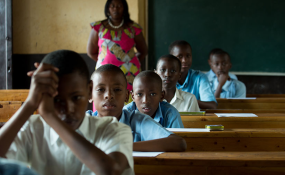 Primary Leaving Examination candidates of Groupe Scolaire Sainte Famille in Kigali (file photo). The number of candidates who will sit the nationalPrimary Leaving Examinations (PLE) has increased up by 12 per cent compared to last year. According to Rwanda Education Board (REB), PLE candidates grew from 227,870 to 255,578 this year. Speaking to The New Times, Dr Alphonse Sebaganywa, the head of Examinations, Selection and Assessment Department at REB, the increase is attributed to easier access, mobilisation as well as the ongoing infrastructure development in schools. He added that the number of candidates was expected to keep increasing in the future. Primary Six candidates will sit Mathematics, Social Studies, Science and Elementary Technology, English and Kinyarwanda. The exams are scheduled from November 12 to 14. Sebaganywa said REB was working with other stakeholders such as schools, local leaders as well as the Rwanda National Police to ensure smooth exams. Such cases include teachers who tend to cheat on behalf of candidates, students who may enter exam rooms with hidden notes, among others. "We urge all players to be vigilant so that exams are smooth and done in allocated time," he added. Meanwhile, Ordinary and Advanced level candidates will sit their national exams from November 20 to November 30. Up to 98,898 of candidates will sit O'level exams, an increase from 96,657 last year. In A'Level, 46,024 candidates will sit this year's exams up from 40,772 candidates who sat the exams the previous year. Sebaganywa said that all is set for candidates from Science combinations who will sit practical exams in Biology, Chemistry and Physics. This is the first time candidates will sit exams in line with the new Competency Based Curriculum (CBC) launched three years ago. "If you look at the CBC syllabus, the content didn't change but what mainly changed was the way of teaching and learning where we shifted from theory to practice," said Sebaganywa. "The exams were set based on CBC but not at hundred per cent because we know there has been a challenge of using it in schools". Marking the exams will start in December followed by grading and placement. PLE and O'Level results will be released in the first month of January while A'Level results will be released weeks later, according to Sebaganywa.